Title page of Greenes Groats-worth of Witte, STC 12245. Yes, trust them not for there is an upstart crow, beautified with our feathers, that with his tigers heart wrapped in a players hide, supposes he is as well able to bombast out a blank verse as the best of you, and being an absolute Johannes factotum, is in his own conceit the only Shake-scene in a country. Other news I am advertised of, that a scald trivial lying pamphlet called Greene's Groatsworth of Wit is given out to be of my doing. God never have care of my soul, but utterly renounce me, if the least word or syllable in it proceeded from my pen, or if I were any way privy to the writing or printing of it. 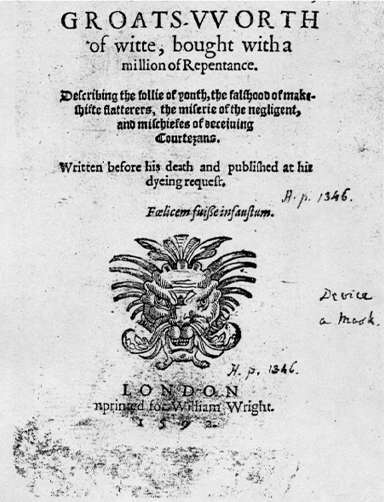 About three months since died M. Robert Greene, leaving many papers in sundry booksellers' hands, among other his Groatsworth of Wit, in which a letter written to divers play-makers is offensively by one or two of them taken, and because on the dead they cannot be avenged, they wilfully forge in their conceits a living author, and after tossing it to and fro, no remedy but it must light on me. Doubts about Robert Greenes authorship of Groatsworth have persisted to the present day.